U.S. #3855 from a set issued to mark the 200th anniversary of the expedition. Explorer, soldier, and politician Meriwether Lewis was born on August 18, 1774, in Ivy, Albemarle County, Virginia. The son of a solider that died of pneumonia in 1779, Lewis relocated to Georgia after his mother remarried the following year. Lewis didn’t receive a formal education until he was 13, but until then he learned to become a skilled hunter and outdoorsman. He had a keen interest in natural history and learned from his mother how to gather wild herbs for medicinal uses. When he was 13, Lewis was sent to Virginia to be educated by private tutors. He then attended Liberty Hall (present-day Washington and Lee University). After graduating, he joined the Virginia militia in 1794. In that role he helped put down the Whiskey Rebellion (a protest against the first domestic product tax of the new American government). 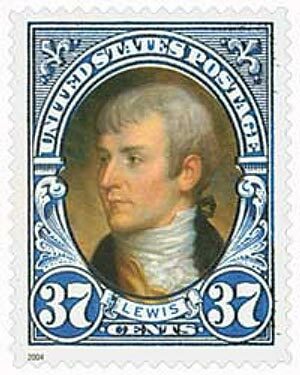 Lewis went on to join the U.S. Army in 1795. He would ultimately reach the rank of Captain, after which he left the military in 1801. During his service he first met William Clark who was then one of his commanding officers. U.S. #1063 was issued for the 150th anniversary of the expedition. In April 1801, President Thomas Jefferson appointed Lewis as an aide. Living in the presidential mansion, he got to meet many leading political figures. After Jefferson purchased the Louisiana Territory, he appointed Lewis to lead the Corps of Discovery Expedition west. Lewis then selected his former officer Clark to share in the command. 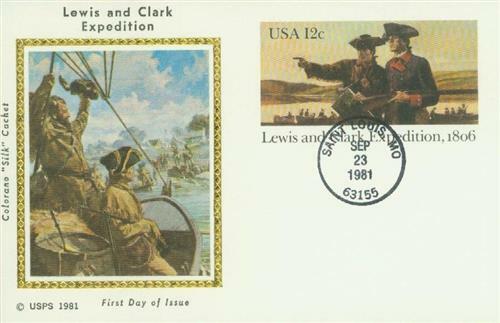 U.S. #BK297 – 32-page Lewis & Clark Prestige booklet. Includes 20 stamps, facts and maps that take you on their journey! The Corps began their journey in May 1804. Over the next two years they braved their way across the country in dangerous conditions. Along the way, Lewis kept a detailed journal and collected plant and animal samples. He was also shot by one of his men while hunting but survived the wound. Click here for more about the expedition. 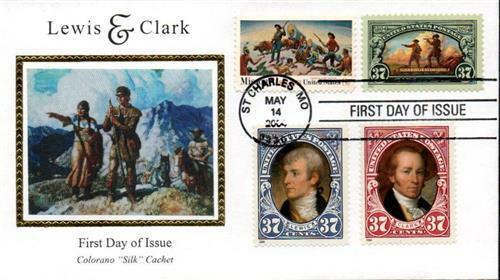 U.S. #UX91 – Lewis and Clark Silk Cachet Postal Card. Upon his return from the expedition, Lewis received 1,600 acres of land, and was later made governor of the Louisiana Territory. In that role, he published the first laws in the Upper-Louisiana Territory, created roads, and promoted the fur trade. He also negotiated peace among warring Indian tribes. 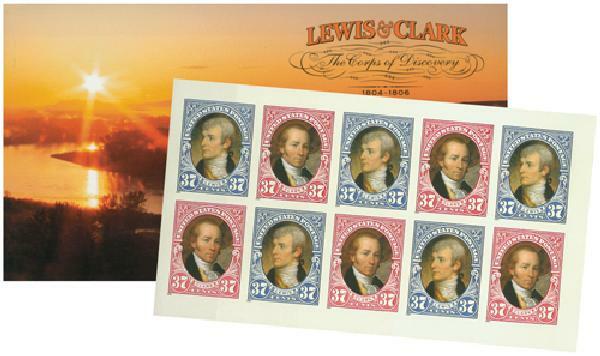 U.S. #3854-56 – Lewis and Clark Silk Cachet Combination Cover. Assessments of Lewis’ work as governor are mixed, in part because it appears his secretary, Frederick Bates, hoped to remove him from the post and take his place. Among other things, Bate sent letters to Washington, D.C., claiming that Lewis had profited from a mission in which he returned an Indian chief to his tribe. Lewis had paid for the expensive trip with his own money, but was then denied reimbursement due to Bates’ claim. 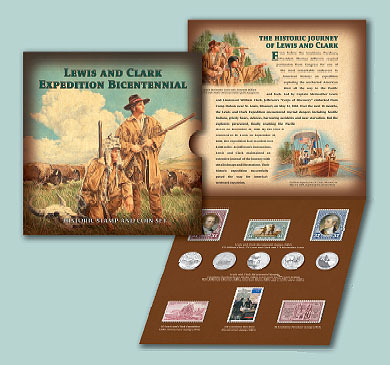 Item #4596579 – Lewis and Clark stamp and coin set. On September 3, 1809, Lewis left to Washington, D.C., to clear up the situation. A month later, while spending the night at an inn in Tennessee, Lewis suffered multiple gunshot wounds and died shortly after. While his death was ruled a suicide, some, including his family, believed he was murdered. Click any of the images above for more conditions and covers and to add these items to your collection. Click here to explore Lewis’ journals from the Corps of Discovery. 11 Responses to "This Day in History… August 18, 1774"
Wow, while having some knowledge of Lewis and Clark I did not know of the circumstances surrounding his death or the problems he encountered with Frederick Bates. Thank you for the article. I never knew his death was ruled a suicide. I assumed he was murdered also from other articles I have read. Thank you, enjoyed this immensely. Is this going to be another event erased from history by radical progressives due to Clark’s owning of a slave, York? Where will it end. I believe that Mr. Lewis was murdered for political reasons, and the first suspect that comes to my mind was none other than his secretary Frederick Bates! Historians should look closely on this matter. Most historians of this period are convinced that Lewis committed suicide; there is really no evidence to the contrary. In the last years of his life, Lewis was a very troubled man. He was tasked by Jefferson to organize the notes of the expedition to the Oregon coast, but four years later, he had done nothing about it. Lewis was certainly held in high regard by all of the men on the expedition. William Clark was Lewis’ former commanding officer, but on the expedition, they shared command as equals. William Clark named his first son, Meriwether Lewis Clark. I request that political rants that are at best remotely connected with the subject not be approved here. One of them above is an obvious example. Unfortunately, Politics, History, and these stamps that represent these periods of our past cannot be separated. Our history is a rich one for a new nation that in essence was an experiment. 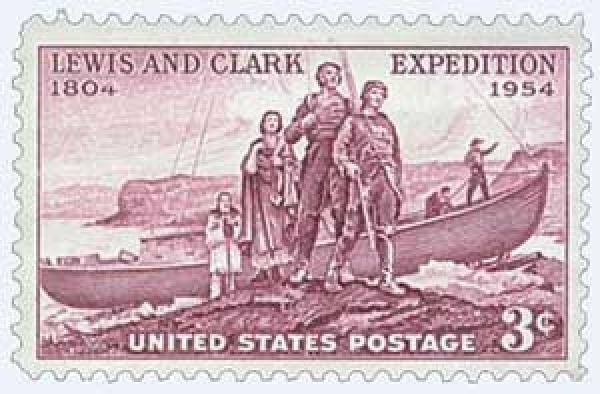 Our stamps, and the events they commemorate, such as the Lewis and Clark expeditions are significant points in our history and it is imperative that these events be preserved for our posterity. These were great men during a difficult time of our history. By commemorating them and then talking about them, prompts us to delve further into these events, such as York’s contribution. I appreciate these accounts of the stamps that commemorate our rich history and prompt further research about their events. Great job by Mystic in their bringing to the forefront, the history behind these men and events which then foster further the individual research of our heritage. Not true that “most modern historians” believe Lewis’ death was a suicide. In fact, most modern historians won’t opinionate. The post mortem performed in 1848 coccluded it was murder. The money and journals he was carrying were never found, and most importantly, even then people didn’t commit suicide by shooting themselves in the stomach, then a glancing shot to the head – not to mention it would have been very difficult to reload a muzzle- loading flintlock pistol so quickly in the condition Lewis would have been in after either wound. Lewis did have issues, leading some to conclude he was prone to suicide. It should be noted that his predecessor as governor, Wilkinson, was known to be corrupt. Lewis’ Secretary, Francis Bates, also served under Wilkinson, and there are plenty of reasons to suspect him of wrongdoing.